Jonathan Pedersen, Vice President of Sales & Business Development for Monrovia, explains how SunBelievable is different from other Helianthus x annuus and how the sunflower complements consumer demands. 1. What makes SunBelievable different from other Helianthus x annuus on the market? There are many remarkable attributes, but the top three are: (1) because it’s sterile, it flowers consistently and prolifically for months; (2) as a day-length neutral hybrid, it blooms even on shorter days in both spring and fall; (3) its multi-branching habit makes it an excellent choice for both borders and containers. 2. What traits are consumers looking for in sunflowers, and how does SunBelievable complement these trends? Consumers want plants that flower for an extended period of time, and can pull double duty in the garden and as a cut flower. They are also seeking flowers that benefit pollinators. SunBelievable produces over 1,000 flowers on each plant in a single season, starting in late spring, throughout summer until first frost. And, while it doesn’t produce much pollen, it’s a rich source of nectar, providing lots of food for bees and other beneficials. 3. How can garden centers merchandise SunBelievable to showcase its features and educate customers about the benefits? Garden centers can get lots of attention with this plant by massing it in a display, recommending it as a solution for tough spots, and by showcasing its use as a lovely cut flower. We will be providing signage and promotional materials, and garden centers will be seeing this plant in consumer press and social media leading up to Mother’s Day. 4. What care is required for consumers to be successful with SunBelievable? The great news is SunBelievable powers on the flowers yet doesn’t require more care than any other annual in the garden. Give it full sun, regular water, fertilizer, and enjoy. 5. Where does SunBelievable perform best? This plant has been trialed in both containers and in the landscape (in the UK and in the U.S.) and has been equally successful everywhere. With a naturally rounded shape (32” high by 40” wide), it’s an ideal choice for a colorful low border or massed in a sunny spot along a walkway, and for adding charm to a perennial or vegetable garden. 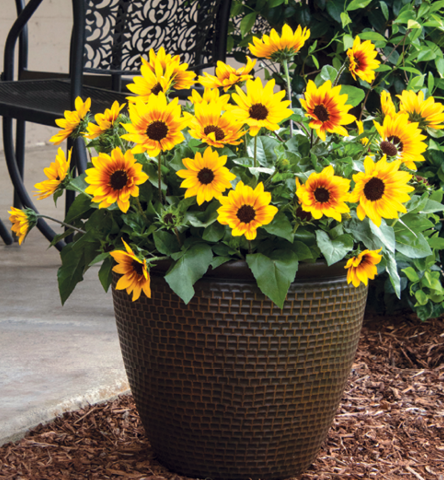 SunBelievable also rebounds from a hot and/or dry spell, so it thrives in containers. It’s the perfect addition to just about any garden situation. Viking & Viking XL begonia from Sakata Ornamentals, the conquering garden performers! This Begonia semperflorens offers three striking leaf colors — green, bronze and deep chocolate — with an abundance of flowers for massive color impact. Viking series includes eight colors, while Viking XL offers four, including AAS-awarded Viking XL Red on Chocolate. SunPatiens impatiens from Sakata Ornamentals is one of the leading brands in today’s marketplace. Trusted by growers, retailers, landscapers and consumers — SunPatiens deliver value — three seasons of color in both sun and shade! New colors include Compact Orchid Blush and Vigorous Lavender Splash. Spring Grandio pansy from Sakata Ornamentals is specifically bred for early spring production. Early blooming across all varieties — more daylength neutral. Incredible plant uniformity and matched bloom time. Series includes twelve bright colors and two mixes. You’re invited to bloom with us! Our Sakata team would love for you to join us for our 2019 California Spring Trials — get a first look at 84 new introductions, meet old friends and new, and connect at this exciting industry event. After all, it’s in our nature! You can see Sarena Robertson at the stop or contact her by email at srobertson@sakata.com or by phone at 669-286-6516. After the show, many locations donate their plant material to local organizations and charities. Thousands of dollars are raised. Sakata donates to our local fairgrounds, our local animal shelter and Leadership Gilroy. Funnyplums is the more compact of two new series of patio tomatoes ideal for growing in pots. Available in three colors, Orange, Creamy-Yellow and Red, the tomatoes are prolifically produced above the foliage, and are very flavorful. Make great larger pots of mixed fruit colors, or combination pots of herbs, tomatoes and flowers. Speedling has changed its layout to include an easier visitor flow and a lounge area. Join us for lunch and enjoy the best barbeque and tacos the area has to offer. During your visit, meet with world-class growers, breeders and a soil vendor at one location. Stop by the Mission San Juan Bautista in San Juan Bautista, California. The stop includes a church, museum and garden area, all open to the public. Guided tours need to be scheduled in advance. The town square has a variety of local eateries and shops well worth exploring. You can see Deborah Troy at the stop or contact her by email at Dtroy@speedling.com or by phone at 813-649-2218.